The European automotive sector has ascended to the top of the global industry. It has achieved record sales, and—as a major employer and a source of significant grantmaking—it is an integral part of European society. Fundamental changes in the industry, however, are threatening Europe’s lead position. If the European automotive sector is to stay ahead in this changing competitive landscape, leaders will need to make some tough decisions. Above all, a shared vision regarding the sector’s positioning is needed. To inform the discussion, we undertook a study examining the future of Europe’s automotive industry. The research drew on proprietary knowledge and analysis from the McKinsey Center for Future Mobility, interviews with automakers’ executives and members of the European Automobile Manufacturers’ Association, and conversations with stakeholders in key automotive associations. Our findings are presented in our new report, RACE 2050—a vision for the European automotive industry, which imagines the industry as a Responsible Automotive Customer-centric Ecosystem (RACE). The report itself is structured in three parts. The first looks at unprecedented changes in the European automotive industry, the second at a long-term vision for the sector, and the third at five clusters of initiatives that could help deliver on the vision. The remainder of this article focuses on the future vision and what it will take to ride the wave of technological megatrends redefining mobility. To maintain Europe’s leadership position in the global automotive industry, a compelling narrative for the long-term vision of the European automotive sector is required. Included in this narrative is a clear understanding of the building blocks of the vision for 2050 (see sidebar, “Building blocks for the industry in 2050”). 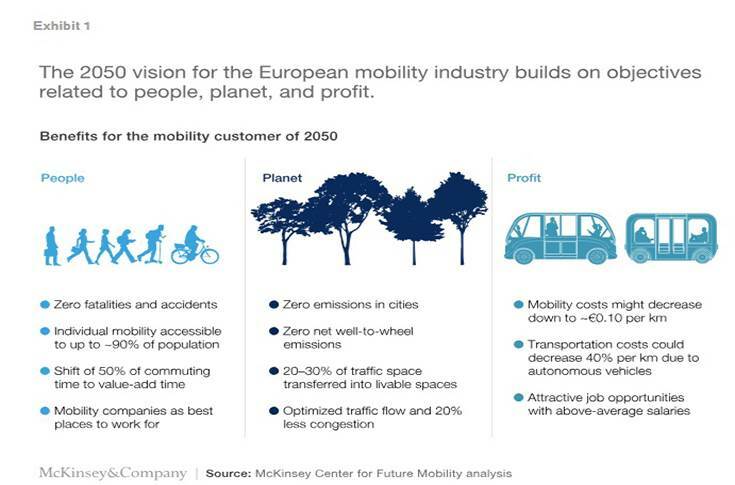 McKinsey’s vision for the European automotive industry is built on the fundamental belief that the industry—currently a global leader in selling and exporting technologically advanced products—will have to master a paradigm shift from an automobile industry that sells and services vehicles to a mobility industry that offers myriad solutions for the transport of people and goods. Three building blocks—customer orientation, environmental awareness, and economic value creation—have been the solid foundation for the success of the European automotive industry in the past (Exhibit 1). Looking ahead, these concepts, taken to the next level, also constitute the foundation of the vision for the future. In other words, the moves from customer orientation to customer centricity, from environmental awareness to sustainable mobility, and from profitability to positive economic value add the “European way” will be fundamental to creating the 2050 target state for the European automotive industry. In the report, the concept of the European way of future mobility is introduced with a clear value proposition for diverse, global mobility needs that the European automotive industry is in a strong position to satisfy. 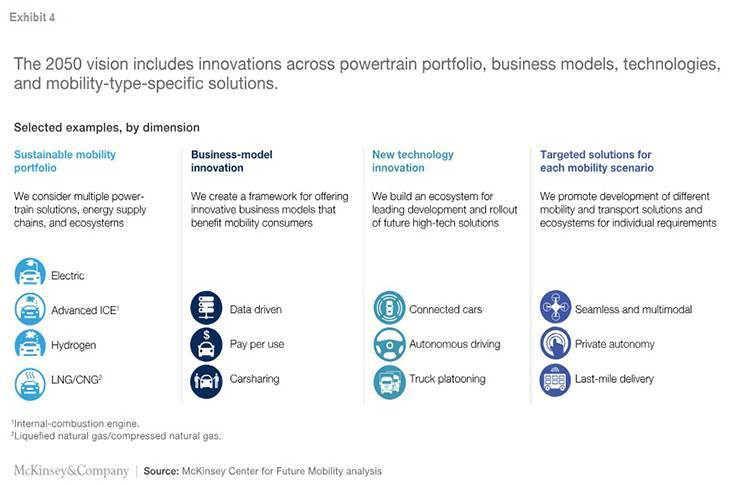 The customer is at the very heart of McKinsey’s vision for 2050 for both individual mobility and commercial vehicles. In light of ubiquitous information and big data, a customer-centric approach to mobility (versus a technology-focused approach) is essential to winning the next generation of customers. The number of fatal accidents in Europe has been immensely reduced (by over 40 percent) since 2005. Our vision is to achieve zero accidents by 2050. The EU mobility industry could be at the forefront of that vision, spurred by many innovations in active and passive safety as well as advanced driver-assistance systems (ADAS) technologies. Additionally, individual mobility will be accessible to a higher share of the population—up to around 90 percent (including disabled people, teenagers, and senior citizens), compared with the current 60 to 70 percent. Mobility costs could decrease to €0.10 per kilometer for certain use cases through technological advancements, new powertrains, and optimized shared-mobility services. Thus, lower-income groups can be reached. The usage of individual mobility by younger (under 18 years) and older age groups, as well as by people with partial disabilities, will also increase through advanced ADAS systems and, ultimately, connected and autonomous vehicles. Above all, with the autonomous vehicle (AV) technology-related innovations mentioned above, 50 percent of commuting time will probably shift to value-add time. People can use the time during rides more efficiently and also differently—depending on whether they take a connected and autonomous vehicle or make use of shared-mobility services such as ridesharing. The potential economic impact of freed-up time is impressive. The average EU citizen spends 40 minutes of his or her daily time in a car. A hundred million people in cars every day equals approximately 65 million hours spent. Assuming that 50 percent of that time could be used for efficient working, the shift in commuting could have a macroeconomic impact of roughly €1 billion per day in Europe. It should not be overlooked that until today, the industry has created not only a significant amount but also a diverse set of employment opportunities. A dense network of universities, dual-system education, apprenticeship, and professional-development opportunities offered by automotive companies have resulted in essential assets for the industry: a highly qualified workforce and world-class engineering that spurs the technical progress of the automotive industry. To remain an innovation leader along the ACES megatrends (autonomous driving, connectivity, electrification, and shared mobility), different skills in automotive will become increasingly important: software, advanced data analytics, artificial intelligence, electrical engineering, and electrochemistry, to name a few. 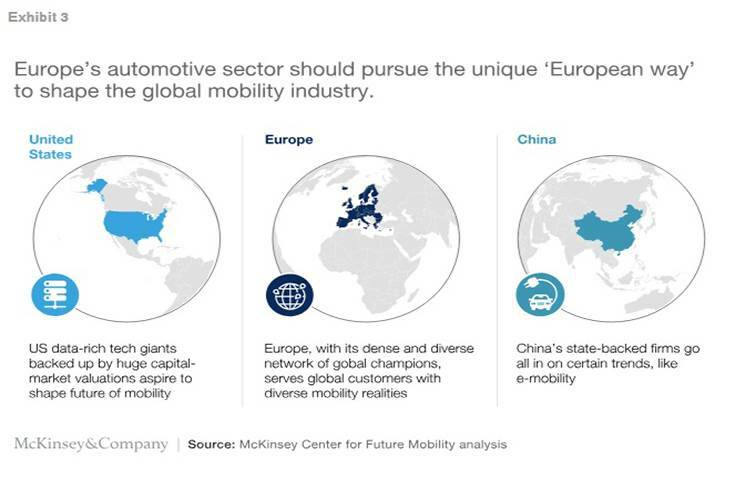 McKinsey envisions the European mobility industry continuing to be a significant talent and job engine for Europe that successfully manages a fundamental employment transition from a mechanical and automotive-engineering focus to a software and mobility-engineering focus. Despite the ongoing important discussions about emission compliance, it is a fact that passenger- and commercial-vehicle fuel consumption and carbon dioxide (CO2) emissions per vehicle are today much lower than they were 20 to 30 years ago. Nevertheless, this is not enough by far. Our vision goes beyond the 2030 targets and the Paris Agreement as well as beyond the United Nations Environment Programme and its 2030 agenda, aiming at realizing zero net-impact emissions, including emission-free cities as well as carbon-neutral fuels and green electricity for further suburban and rural mobility and transport applications. Zero net-impact emissions mean that the use of the automobile leads to zero emissions in total, either due to tank-to-wheel emission with green electricity or hydrogen or, in the case of local emissions, because the fuel is carbon neutral (for example, biofuels and e-fuels). The automotive industry could furthermore contribute to an effective carbon abatement across industries either through demanding renewable-energy sources for hydrogen or electricity or, alternatively, through an effective emission-certificate trading system to maximize the emission reduction per euro spent. The second core element of our vision is to contribute at large to the protection of the environment for future generations. The 'RACE 2050' vision aims to create a sustainable mobility industry by being the undisputable front-runner in emission reduction that achieves zero net-impact emissions by 2050, alongside the three subsequent transformational steps of tank-to-wheel CO2-emissions reduction, emission-free cities, and well-to-wheel CO2-emission reduction (Exhibit 2) for both passenger cars and commercial vehicles. In our vision, clean cities with zero local emissions become reality by utilizing, for example, fuel-cell, electric, and hybrid cars, buses, and commercial vehicles for last-mile transport. In suburban areas, the future state depicts a powertrain portfolio composed of predominantly electrified powertrains (including hydrogen) but also carbon-neutrally fueled internal combustion engines that are each best suited to a specific use case. 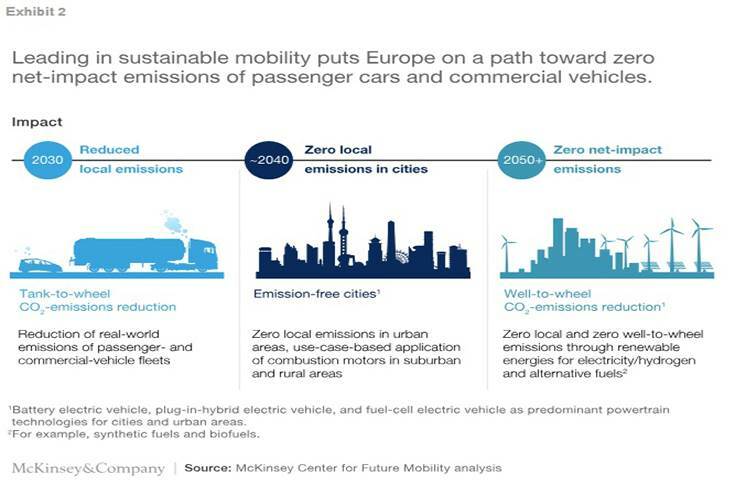 McKinsey also envisions zero well-to-wheel emissions through renewable energy sources for electricity and hydrogen, as well as alternative fuels with zero-carbon footprint (for example, synthetic fuels, biofuels, and e-fuels) complemented by carbon capture and storage. Europe should strive for a diverse powertrain portfolio optimizing power consumption, environmental protection, customer usability, and economic contribution. Economic-value contribution is one of the core requirements to create a profitable future mobility industry and to maintain relevance as a global export industry. Revenue pools and—even more radically—profit pools are expected to switch from traditional business models of classic vehicle sales and aftermarket toward disruptive business models, including mobility as a service, data-enabled services, as well as connected and autonomous vehicles and electrified vehicles. According to the McKinsey Auto 2030 model, European automotive revenues based on consumer spend will almost double from €850 billion in 2016 to €1,400 billion in 2030. Over the same time frame, the share of data-enabled services and shared mobility will increase to 27 percent of total automotive revenues, from 0.2 percent. To capture a relevant share of the industry profit pool, European automotive players need to secure several of the so-called industry control points, that is, technologies that make full or partial control of entire processes and systems feasible. Potential player-specific control points include battery cells, battery-management systems, intelligent e-drive systems, fuel-cell systems, artificial-intelligence software for AVs, and mobility platforms. On the commercial-vehicle side of the vision, reduction of inefficiencies through multimodal optimization of holistic transport ecosystems is key. As surface freight intensity is expected to increase by 40 percent through 2050, and intelligent transport-mobility solutions are being developed (for instance, moving parcel lockers), our vision is a 100 percent on-time, cost-efficient, and customer-focused delivery. Based on the technology of autonomous commercial vehicles, transport costs may, in some use cases, even decline by up to 40 percent through 2050. The position of Europe’s automotive industry is unique in the world and is comparable to neither the United States nor to China. In the United States, data-rich tech giants seem to set the trend for the future of mobility. Due to their high valuation at capital markets, new models can be freely developed without them needing to be immediately profitable. In China, on the other hand, state-backed companies clearly follow the top-down direction supported by policy makers. Therefore, Chinese companies do not take a risk when they exclusively concentrate on e-mobility. Neither strategy is a possibility for Europe with its grown automotive industry and its democratic and federal system. Thus, in our vision, the European mobility industry needs to follow its own path of success: the European way (Exhibit 3). The European way can be described as a way to serve global citizens and their diverse set of mobility needs by developing optimized solutions locally and scaling them globally. Europe is a diverse breeding ground for future mobility solutions. This diversity is a strength. Europe is already enjoying the future of mobility on a small scale—and solutions that work well in Europe have the potential to be rolled out globally. Its diversity can be manifested along four dimensions: people, economies, technology, and mobility realities. More than 500 million people live in the European Union’s 28 countries, each with several distinct regions. This diversity is a huge asset for the overall economy and individual companies in terms of the availability of a large and diverse pool of profiles and talent—and eventually the richest and most diverse pool of consumer data. The integrated customer base of the EU-28’s market is also uniquely multinational: about two million people commute to work across borders, and there are approximately 1.3 billion crossings yearly in the Schengen area. In 2018, the total economy of the EU-28 at €15.8 trillion was around 39 percent bigger than China’s economy at €11.3 trillion and only about 9 percent smaller than the US economy at €17.2 trillion. What is more, EU-28 road freight transport increased 9 percent from 2012 to 2016 and reached 1.85 trillion metric-ton-kilometers.2 Intra-EU trade was valued at €3.3 trillion in 2017. That is 5.8 times more trade value than European trade with China at around €570 billion per year. Furthermore, commercial vehicles have largely contributed to an integrated automotive-manufacturing industry connecting plants in Eastern Europe with the consumer markets in Western Europe. Europe is home to many global players, each a champion in a particular market or consumer segment. A collaborative spirit among these tech leaders is a foundation for future global success. Furthermore, Europe is home to numerous market-leading “hidden champions.” Depending on the definition, up to 75 percent of hidden global champions specialized in a diversity of technologies have their roots in Europe. The sheer innovation power of the region can be illustrated by the fact that roughly 60 percent of all global patents in autonomous driving are filed by European players. Europe has a number of low-income, dense cities (for example, Athens and Bucharest) in which shared multimodal trips centered on human-driven cars, two-wheelers, (electrified) minibuses, and micromobility are most likely to be close to the future state in 2050. In high-income cities with suburban sprawl, like Brussels and Munich, private cars might maintain their dominance as the central element of mobility, and connected and autonomous vehicles will allow passengers to use time in traffic for business or pleasure. In high-income, dense cities, such as Berlin, London, and Paris, rapid social change, system coordination, and deployment of mobility solutions may result in a radically different mobility system. With a fast public-transport system as a backbone, a fleet of shared, self-driving, and electrified cars providing on-demand, door-to-door mobility is most likely to be the reality in these cities in 2050. About a quarter of the European population lives in rural areas. Their mobility needs differ from those of the urban population and depend more on individual mobility. In high-income, rural areas, private mobility may resemble suburban areas. Mobility solutions may have to target groups that have no access to mobility now, including young, elderly, and (partially) disabled persons. For low-income areas, (electrified) minibuses could be part of the mobility solution. While mobility infrastructure in rural areas cannot be changed as quickly and effectively as in cities, in the long term, hydrogen and alternative CO2-neutral fuels will play important roles. Medieval city centers in Europe add a further element of complexity and diversity to future mobility requirements. Innovative electric micromobility solutions (for example, e-bikes, e-scooters, and new forms of electric two-wheelers) will become an important cornerstone of Europe’s future mobility portfolio, with different requirements ranging from narrow-street medieval city centers to congested megacity traffic arteries. Other regions show a different mobility pattern than Europe. In the United States, suburban traffic represents the majority of automotive mobility; in China, big-city mobility solutions are dominant, as the average driving distances are less than 40 to 50 kilometers per day. In other parts of the world, however, the mobility reality will become as diverse as it is in Europe. Clearly, the automotive industry and its underlying value pools are currently changing dramatically. To be able to secure a big share of the sector’s future revenue and profit pools, Europe’s automotive industry should leverage its diversity-based strengths to adjust to and actively shape the ongoing disruption and megatrends in Europe’s and the world’s mobility landscapes. Today, automotive revenues are mainly generated through classic businesses (vehicle sales) and aftermarket services (2017: approximately €3,000 billion, globally). Our analyses show that global automotive revenues will nearly double to around €5,500 billion in 2030 and will mainly originate from disruptive business models, such as mobility as a service and data-enabled services. At the same time, profit pools will shift even more toward new technologies and services, with more than 80 percent of the industry profit pool originating from ACES technologies and new business models. Therefore, the European automotive industry will have to secure control points to maintain a profitable position in the future and to participate in the changing revenue and profit pools. Accordingly, Europe’s position as global leader and the strengths of the European way should be leveraged to create optimal mobility solutions for the different needs of global consumers and customers, based on Europe’s unique diversity of mobility realities, talents, and technology. By following the European way, the European automotive industry has the power to actively shape the global mobility ecosystem by creating and establishing groundbreaking mobility innovations along the four key future dimensions of innovation (Exhibit 4). In 2050, there could be an optimal powertrain for each application—for example, long-distance commercial freight transport via biofuels or hydrogen versus urban last-mile delivery via battery-electric powertrains or hybrid vehicles. Accordingly, there will likely be no one-size-fits-all energy source, and Europe should focus on building a sustainable portfolio of powertrains, including a technology-neutral evaluation. This portfolio would include optimized solutions for each use case and matching local energy supply with demand on a global scale, comprising gasoline, diesel, hybrids of all forms, (compressed) natural gas, synthetic fuels, and fuel cells. Europe should act as an innovation and technology leader for future mobility—in particular with regard to autonomous driving and connectivity—by leveraging its position at the forefront of ADAS research (about 50 percent of global automotive R&D volume in 2016). Europe’s automotive companies, as symbols of quality and safety, are probably in the best position to shape and introduce those technologies. The European automotive industry should establish a framework enabling OEMs to set up and run various business models, such as new mobility services like pay per use, location-based advertising, and over-the-air updates for connected vehicles. This framework would include technological and regulatory standards to provide a fruitful breeding ground for innovative solutions by OEMs and start-ups. Another source of diversity, distinctiveness, and “dominance” can be the so-called multimodal mobility lab that provides the basis for establishing Europe as the leader in designing automotive solutions for different city archetypes around the world. This would imply developing standardized mobility and transport solutions, which can be easily adapted and exported to diverse cities or rural areas worldwide with their unique conditions (for instance, population density, infrastructure, energy supply, and GDP). By building on the European way and actively shaping a new automotive ecosystem alongside the above-mentioned dimensions of innovation, Europe will continue to have the power to create positive economic value. All in all, to maintain Europe’s global leadership position in the global automotive industry, European OEMs need a compelling vision for the European automotive industry in 2050. Delivering on that vision, however, will not be easy. Five clusters of initiatives, detailed in the report, can help. Broadly, the industry needs to embrace collaboration and a new strategic approach to transportation—so that, 30 years from now, industry leaders can say they used the momentum to make several paradigm shifts.